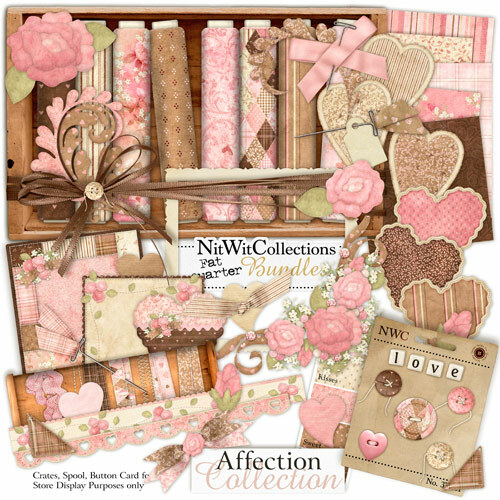 My "Affection" Collection is yet another in this series! What can I say? There's something in the air isn't there? A certain lovey doveyness seems to be on the horizon. Those warm fuzzies that can only be brought upon by love... What am I talking about, you say? Get on with it Mary-Frances you declare... Well it's almost Valentine's Day again, isn't it gentle reader? and that to me means hearts and hearts and more hearts... and well some pretty roses thrown in for good measure. This kit is full of all those lovely, pretty, elements to help you make your loved one's photos shine! Hope your heart is full too!